This week we have been rehearsing our Greek play. Scroll down for details. We are looking forward to lots of visitors for Open Afternoon. In English, we are continuing with our information texts. Spellings this week are focussing on the suffix -ly. Thank you for all of your half term holiday reading, keep it up Year 4! We are really looking forward to rehearsing our Year 4 Greek Play, which will be performed on Thursday 22nd November 2018 at 2:30pm. You are all welcome to bring friends and family members too. Super work learning all of your lines Year 4, we are so impressed. Information is below and can costumes be ready and in school in time for our dress rehearsal on Friday 16th December. You can find the lyrics and music for our songs on the Year 4 Events page on the website. Click HERE to go straight there! Please learn them for our wonderful performance! Children who have been cast as teachers should wear a white shirt and black trousers, children and fact readers/statues in the play should be dressed in ancient Greek clothing. A white sheet is a great idea for a toga, with a belt and white t-shirt underneath. If your child has been cast as a different character (an animal, monster dinner lady etc) we will give them individual ideas to discuss at home. 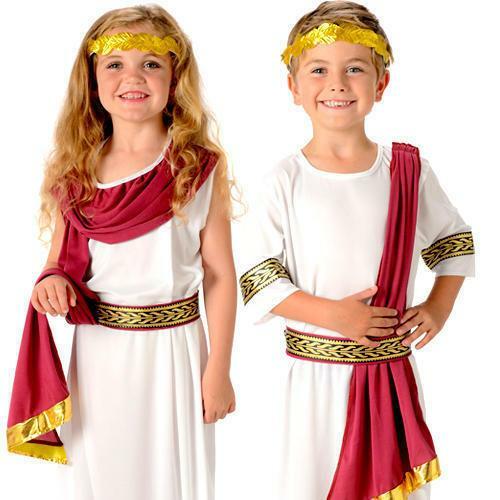 Here's an idea for a simple Greek child costume. Simple Top Tip! It's also been suggested as a great idea for costumes to use an old pillowcase as a toga. Dress it with a belt or bright gold or red material.